For the most part, our hot, dry, and smokey summer is over with, here in the Pacific Northwest. The start of the rainy season is upon us, and temperatures have cooled considerably. 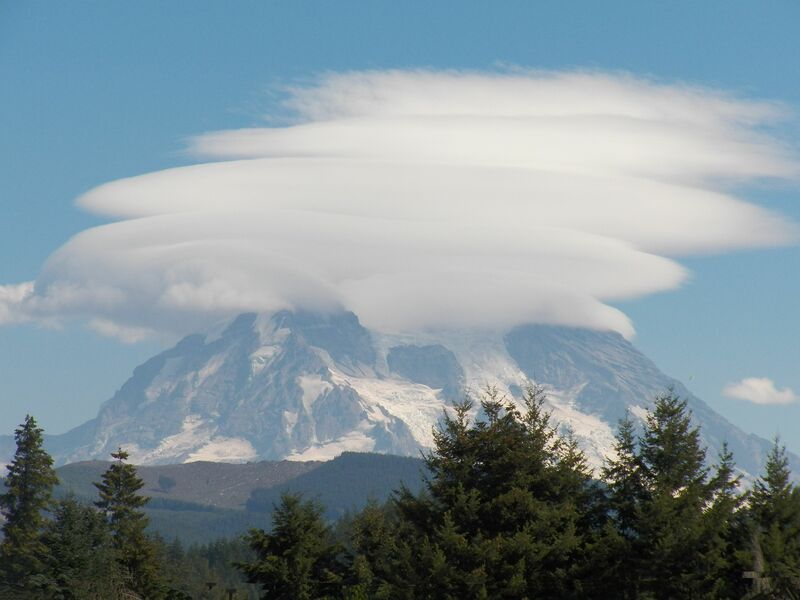 And that means that viewers in the South Puget Sound region can expect to see some dramatic cloud formations over Mount Rainier. 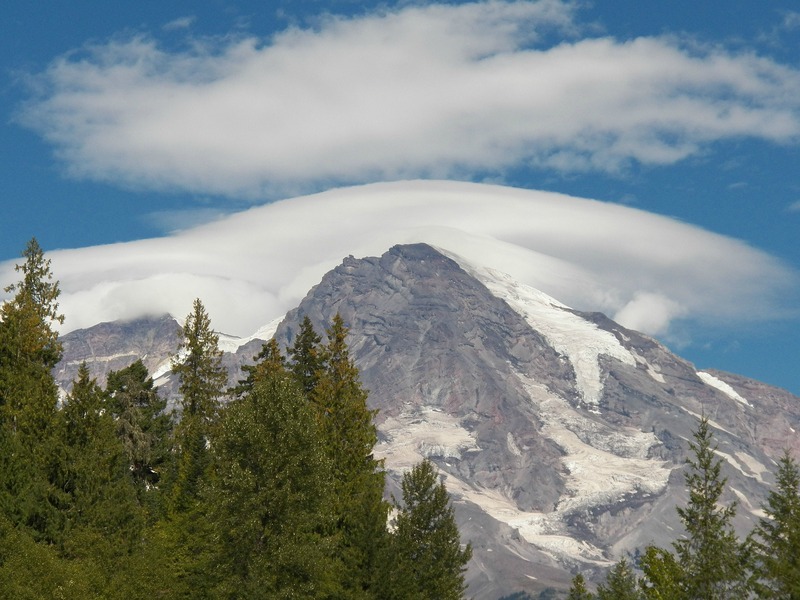 I am referring to Altocumulus Standing Lenticular cloud formations, or “cap clouds.” When seen over the mountain, we like to say that “the mountain is wearing a hat”…sometimes more than one hat, as was witnessed yesterday. This type of cloud forms over the mountain, many times, when a weather system is moving in from the west, bringing in cool, moist air. When I realized what was happening, I grabbed my camera and headed out to snap a few photos of the marvelous spectacle. I ended up inside the national park. Below are examples of multiple Altocumulus Standing Lenticular clouds. Here are a few photo taken inside Mount Rainier National Park, from the Kautz Creek Viewpoint. A long time resident of Washington State, located in the beautiful Pacific Northwest USA. I am retired and enjoy regional travel, exploring all the wondrous, natural settings that the Pacific Northwest has to offer. If you get a chance, visit my Northwestphotos Zazzle store, http://www.zazzle.com/northwestphotos. 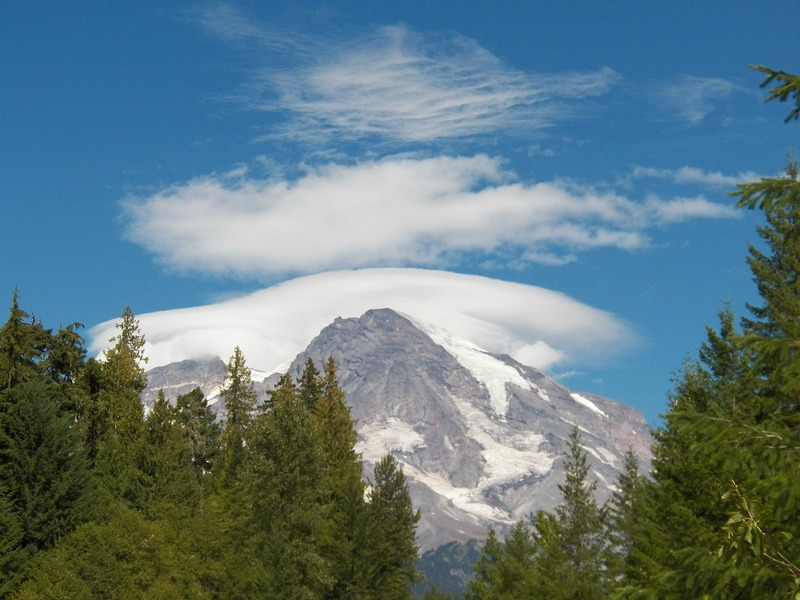 This entry was posted in Nature, Photography and tagged Altocumulus Lenticular cloud, cap cloud, cloud formations, Mount Rainier, Mount Rainier National Park, mountain, nature photography, Pacific Northwest. Bookmark the permalink. Oh, Peggy, I am SO jealous. I’ve looked for lenticular clouds over some of our mountains, but sort of barely came close, but yours are simply gorgeous! Lucky you. What a catch. We are heading up in your direction, but planning to do some camping around the Olympic Peninsula. Won’t be doing Rainier on this trip. Thanks, Gunta! Yes, I have been lucky to capture moments like these! The cap clouds will become more common in the autumn, in-between weather systems coming in from the coast. I study cloud formations closely and seem to have a sixth sense as to when these lenticular clouds form around Mt Rainier. I remember these things over Mount Saint Helens. 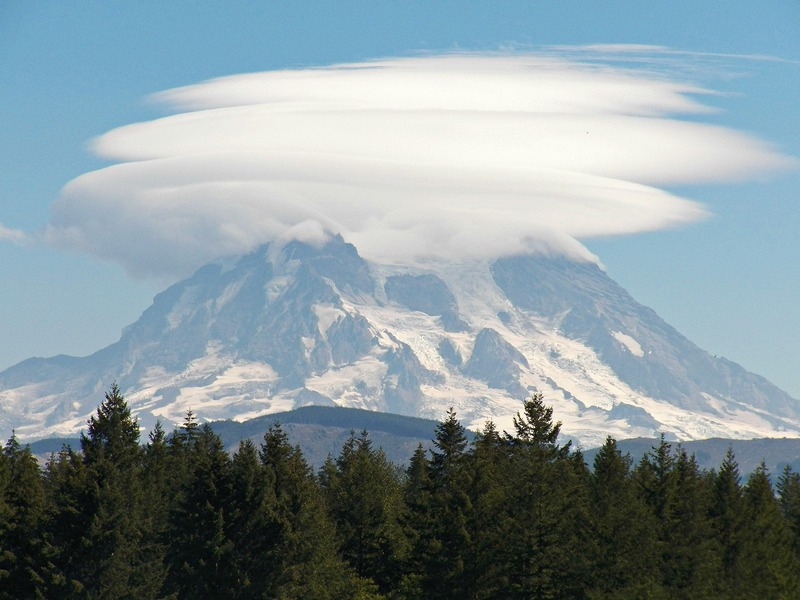 I’m glad you took the time to head out with your camera to capture this multi-layer lenticular formation. What a treat! I live south of Rainier and enjoy views of its camelback profile on clear days. Unfortunately, my view of the mountain is from a mile down the road. Consequently, I’ve seen only one ‘hat’ on the mountain in the 15 years I’ve lived here. And that’s why this blog was a treat for me to see. So glad you enjoyed the treat of seeing so many “hats” on the mountain! Keep a look out for more of these type clouds this fall season. It is when they form the most, just before a moist weatherfront moves into the area. I’m always paying attention to the weather and the clouds and instinctively know when the conditions are ripe for these types of clouds forming over the mountain. To me, it’s worth jumping into my car to ride just down the road to see what’s happening. Another thing you can do is to check out the live web cam in the national park to get an idea of the cloud formations over the mountain. Thanks for the viewing tips. Maybe I’ll get to see another lenticular hat this fall, live and in person.